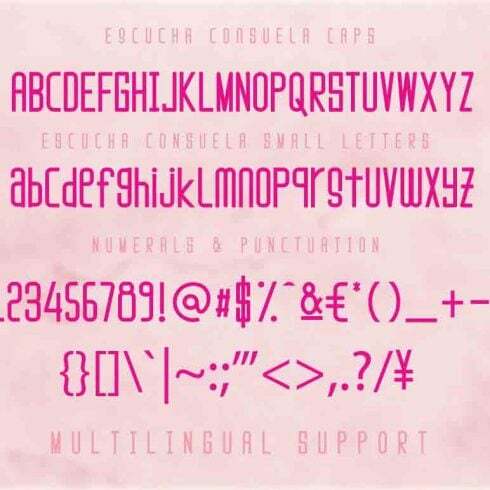 Introducing the Escucha Consuela Font Duo; A stylish & modern of sans & script typefaces. 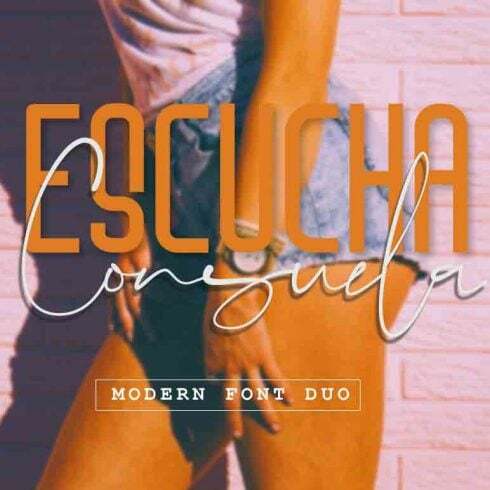 Escucha Consuela offers beautiful contrasting typography for a diversity of design projects, including; logos & branding, packaging design, social media posts, advertisements & product designs. What Are Fonts and Why Are Fonts Vital? Font is a graphic representation of written text. It may often be described as a design pattern for a collection of letters and characters. With different styles, point sizes, font weight, and shade, fonts determine the style of design. The pricing on a single font fluctuate from about $7 to $100 based on the marketplace and vendor. There are 5 types of fonts. Serifs tend to be more classic, you can spot them by tiny lines on the ends of letters. Sans-Serifs are a modern font type, and characters will not have small “feet” . Slab-serifs are massive and blocky, these fonts contribute substance to the style and design. Script fonts resemble hand writing and also have connected letters. Stencils are identified by curved boundaries and narrow strokes, one can rely on them to develop a creative statement. How Can Fonts Impact The Perception of the Product? The standard of typography can determine how consumers comprehend and understand written content. Fonts help to grab attention and determine structure. They establish the atmosphere and create brand recognition. Entrepreneurs know that typography can make or ruin just about any graphic advertisement, logo design, or brand design. As soon as the designer uses sloppy or commonly used typography, people see the style and design as low quality and do not keep reading. When the font is unreadable, the whole original venture does not work out to reach its aims. What Exactly Are Font Packs and What Is Their Price? Font bundle deals have become the staple offers for graphic designers. A bundle is actually a package of several premium quality fonts. A font bundle is priced at considerably less in contrast to price of each of these fonts on their own. Choosing a font bundle you can save up to a whopping 99%. On Masterbundles.com, one can find font bundles within the range of $4- $50, based on the selection of fonts contained in the font bundle. If you look for discount rates, you can save substantially more and obtain amazing fonts for professional use. I Haven’t Found Any Suitable Fonts within This Package ? Don’t worry about it! MasterBundles features lots of different bundle options for numerous events and styles. Just browse through our website and you’ll surely discover something to your taste and requirements. What Other Bundles Do You Sell on Master Bundles? Apart from font deals, MasterBundles offers numerous spectacular design bundles. Consider website template bundles, icons, textures, and patterns, graphic bundles. There are as well e-books and training courses, stock images, logo designs, illustrations and add-ons, mockups, and other categories. We have thematic X-mas and Valentine’s day bundle deals, postcards and powerpoint templates. And also, obviously, our favorite under $5 deals! Master Bundles is the very best place for purchasing website design products that will certainly simplify the way you work in times. We often have excellent sales (approximately 99%) on all goods and web kits because we want to make them reasonably priced for every person regardless of their finances. Even so, you have to be attentive, as the discounts on most sets last for less than five days. If you don’t want to overlook the deals, simply sign up for MB newsletter and stay up-to-date with the most recent arrivals and offered discount codes. To get the available coupon codes, visit this web page.